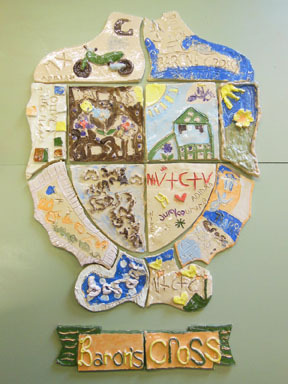 Recently delivered this magnificent coat of arms created by the young people at Barons Cross Youth Centre nr Leominster. 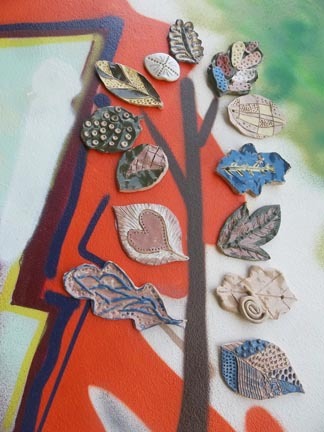 The ceramic crest was created in the depths of winter as part of the influential and socially beneficial Yart project facilitated by Brightstripe. During the early part of 2015, I had the privilege to work with a group of young people at Barons Cross Youth Club near Leominster. YArt or Young Arts Blitz is an exciting artist led program in youth centres around Herefordshire and managed by Brightstripe – Cultural Health C.I.C. Participants at Barons Cross experienced the potter’s wheel and a range of hand building pottery techniques as well as creating their very own ceramic coat of arms. 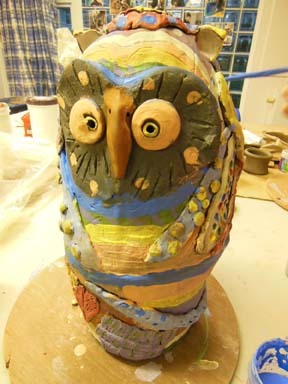 This colourful collaborative owl was made by the young people in the final couple of weeks. I’ve previously met the Queen and HRH Prince of Wales at separate events so not to many members of the Royal family to go! Whilst sticking leaves to the wall at Wigmore, talented young artist Joe was putting the finishing touches to this wonderful sculpture made entirely from re-cycled wood. More of Joe’s artwork can be seen here. Top work Joe! 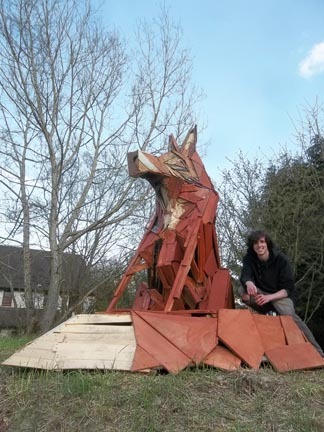 I’ve been working with the young people at Teme Valley Youth Project on an arts project called Yart. 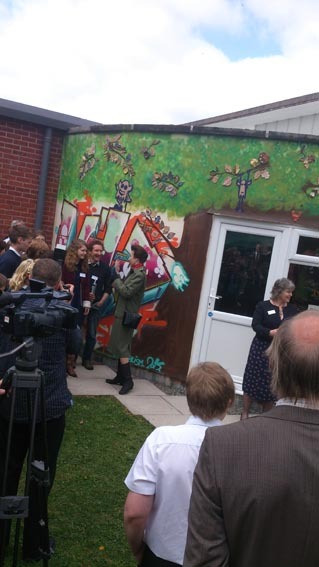 As well as experiencing all the usual benefits associated with working with clay, the participants made these fantastic ceramic leaf tiles incorporated into a graffiti mural painted on the outside of the youth centre. I reckon the effect looks pretty good and one I’d definately like to explore further.